This beautiful brand new 5 bedroom house is completely private and in a quite and rural area just outside the village of Witow about 20min drive from Zakopane. 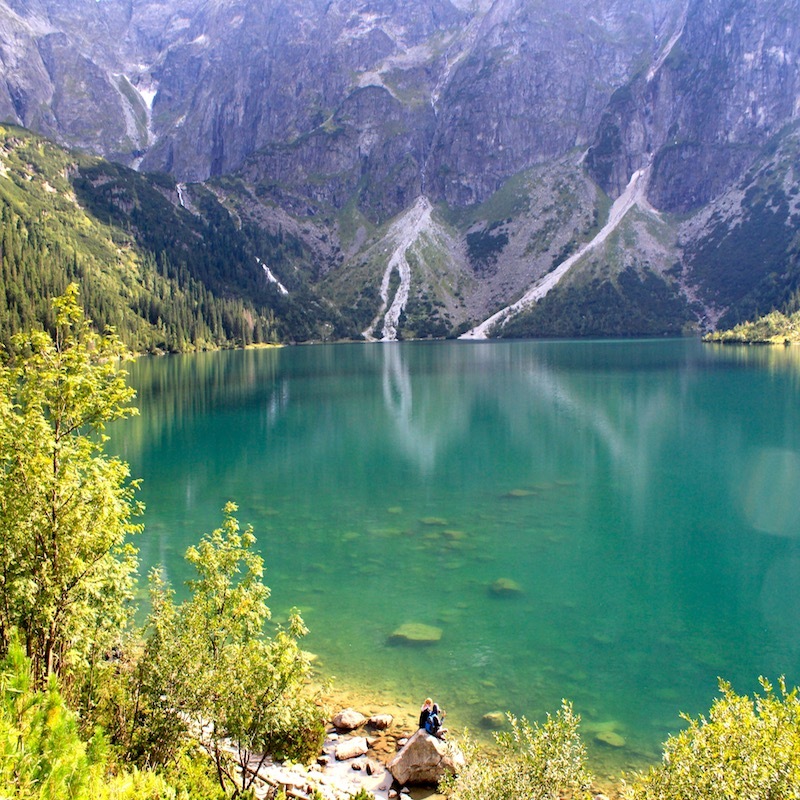 It is the perfect place to experience the Polish country side and live in the Podahale region. From the house you have stunning views over the area and some of the Tatra mountains range. The front entrance to the house has a space to keep boots and wellies, coats and other clothing. There is a fully equipped kitchen, living room, dinning area, Tv, fireplace, separate toilet and main bedroom with ensuite bathroom (with shower) on the ground floor. On the second floor there is a big bathroom with a shower and a bath (beautiful views over countryside), also a mother big bedroom with double bed, sofa bed, Tv and sitting area with table and chairs plus balcony. Furthermore there are another 2 double bedrooms on this floor, each with balcony. On the 3rd floor there is another big room with double bed, seating area and separate toilet. Outside the house there is a beautiful garden and sundeck with a big bbq area. There is also a garage big enough for 2 cars with entrance to the house. The property is located in Dzianisz and fairly easy to find. We will meet you either at the House or at Restaurant Witowianka. It is important to conact us at least a day before your arrival as we need to arrange a meeting and checkin time with our guests. The house is located in Dzianisz about 20min drive from Zakopane. The are many summer and winter activities in the area as the house is situated close to the Tatra mountains and many hiking routes and Valleys, also close to many ski slopes and other cultural landmarks such as the village of Chochołow (listed on Unesco).The brand new Chochołow Thermal Spa is about 5km away and offers outdoor and indoor pools and slides, Sauna´s and Jacuzzis. In the summer activities in the area include; Horse Riding; mountain biking; Quad biking; Canoeing; Fishing; Hiking; Cycling; Rafting and many more. In the winter activities include; Skiing; Cross-country skiing ; Snowmobiling; Husky riding; Ski Tours and many more. There are a few very good restaurants in the area and closer to Zakopane, many more restaurants, shops, bars and nightlife. There are a few small grocery shops nearby but we recommend that you go to nearby Koscieliska Village for bigger grocery stores. Your apartment is booked upon receipt of the booking deposit. The deposit is non-refundable. This prepayment should be made by bank transfer or paypal. Your booking is not confirmed until BazaTatry receives the pre-payment and you have received the confirmation email from BazaTatry This confirmation email contains all your booking details such as the address of the apartment, contact details, balance due and other arrival and departure instructions. The remaining balance due for the booking may be paid by bank transfer at least 2 days before arrival or by cash on arrival at the apartment. * For bookings over Christmas and New Years (23.12 - 03.01) the balance must be paid within 4 weeks. • The booking deposit is non-refundable. • In the unlikely event that BazaTatry is unable to provide the client with the property that they booked or a property with similar or better characteristics a full refund will be issued within 7 working days. Extra services, not covered within the reservation, ie, transport, trips or activities should be made in cash or bank transfer. Apartment Rules The following Rules set out the terms and conditions of holiday apartment rental. By making a booking, you accept these Rules.BazaTatry, reserves the right to refuse acceptance of a booking. The apartment will be available from 3pm, however, if possible, we will always try to accommodate clients arriving early. It is important that we have your correct arrival time, which will be confirmed with you prior to your arrival. Checkin will be at our office BAZATATRY, Kosciuszki 22, Zakopane. We are by the main bus/train station, we will meet you there, give you the keys to your apartment and show you where it is. If you would like to check in or out later or earlier it is very important that you contact BazaTatry first to request this. BazaTatry reserves the right to deny such requests. Checking-in or -out at the time different than indicated and approved by BazaTatry may result in an extra fee payment, paid at site. Should the customer lose the keys to the apartment, they shall promptly notify the agency representative of this fact. A fee of PLN 200 shall be charged for lost keys, gate remote or remote control. The guest shall be legally and otherwise liable for the use of the apartment during their stay therein, and in particular, they shall comply with the rules valid in the entire building. We assume that the apartment and the content is in perfect condition when guests check in unless guests inform us otherwise. If the guest fails to inform us thereof, the guest will be held responsible for damages. Guests are kindly asked to respect the night quiet time from 10 p.m. to 6 a.m. Guests are asked not to disturb other guests staying in the building. BazaTatry has the right to terminate the rental agreement with immediate effect in the case of any negative or aggressive behaviour or any persons disturbing the peace and / or damaging the property. No such termination shall entitle the guest to be reimbursed for any previously paid fees. In the event of the occurrence of force majeure events, BazaTatry shall have the right to cancel the agreement. This also applies to cases in which the personal safety of the customer or their property may not be guaranteed for reasons beyond BazaTatry’s control. Any amounts paid by the customer shall be promptly returned following the deduction of any amounts due for previously provided services. The agreement concluded by and between BazaTatry and the customer only covers accommodation rental. The only additional fee charged by BazaTatry shall be a visitor’s tax in the amount of PLN 2 per person per night. Gorgeous, luxury villa with breathtaking views. It's perfectly balanced between traditional highlander's and modern styles. Extremely functional with all the equipment needed. It's located in the very quiet area, but with some amenities close by - you will need car to get there though. There's food delivery option if you don't feel like cooking at home or drive to the restaurant. Please note, that you are not only getting an accommodation - you're also getting top notch travel agency service. Hosts will help you to get the most out of your holidays if that's what you want (highly recommended ski lessons with Kamil).. It's perfectly balanced between traditional highlander's and modern styles. Extremely functional with all the equipment needed. It's located in the very quiet area, but with some amenities close by - you will need car to get there though. There's food delivery option if you don't feel like cooking at home or drive to the restaurant. Please note, that you are not only getting an accommodation - you're also getting top notch travel agency service. Hosts will help you to get the most out of your holidays if that's what you want (highly recommended ski lessons with Kamil). Extremely functional with all the equipment needed. It's located in the very quiet area, but with some amenities close by. Absolutely stunning house!!! In a perfect location, not too far from shops and attractions, but nicely secluded. Warm and homely feel to the house and great modern kitchen and bathrooms. The views are amazing. We had a BBQ and it was beautiful to sit outside and watch the moon rise. Host provided great tips and suggestions. Excellent place to stay for a few people or a group. Had an amazing time. We loved everything about our stay.